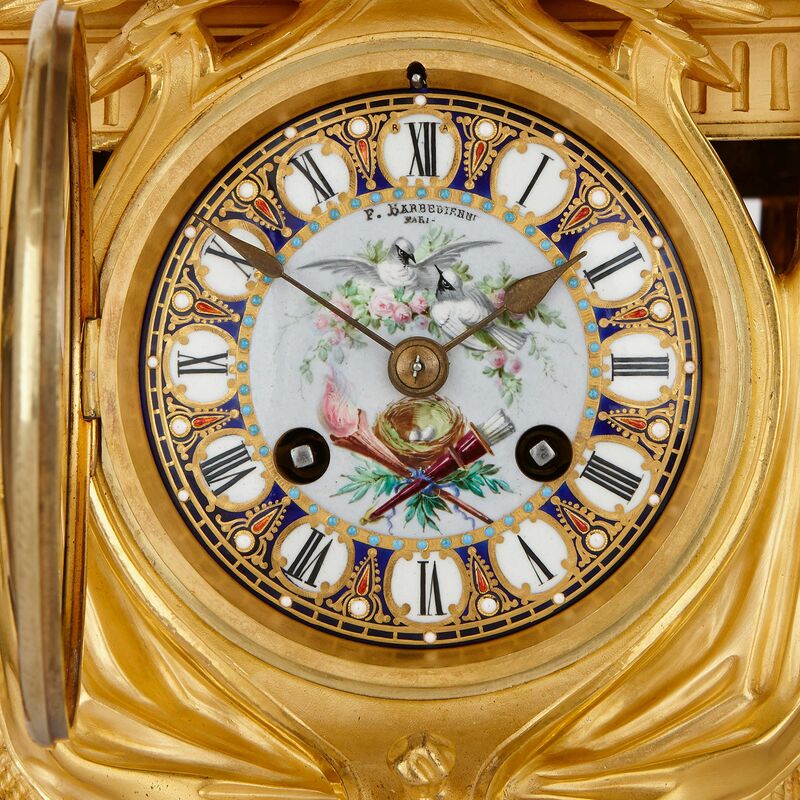 This exquisite clock set was the result of a fruitful collaboration between the master ornamentalist, Louis-Constant Sévin, and famous bronzier, Ferdinand Barbedienne. 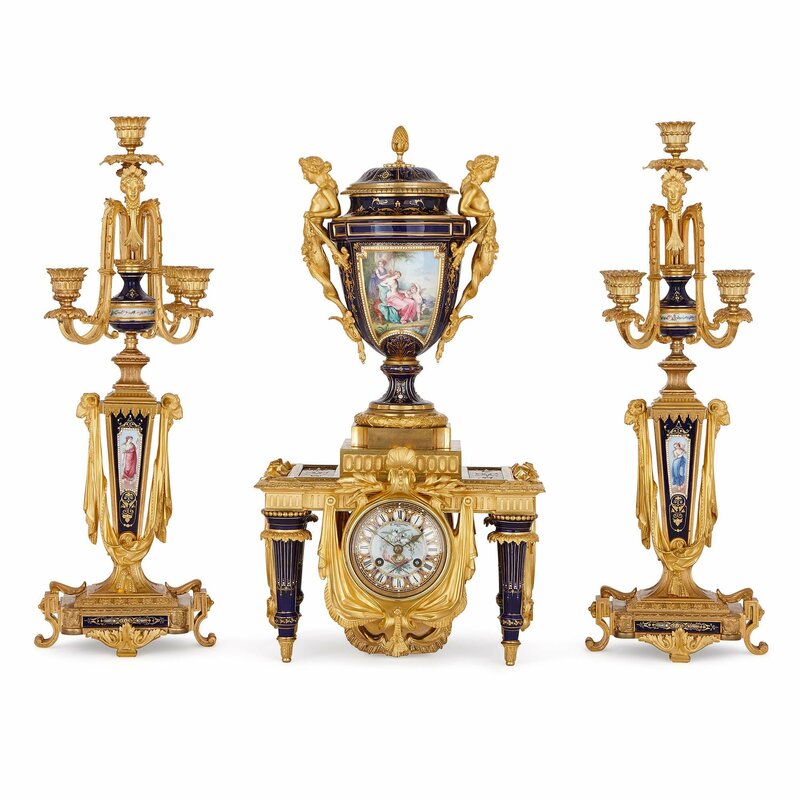 This set consists of a central clock and a pair of flanking candelabras. All three items have been crafted from porcelain and ormolu. 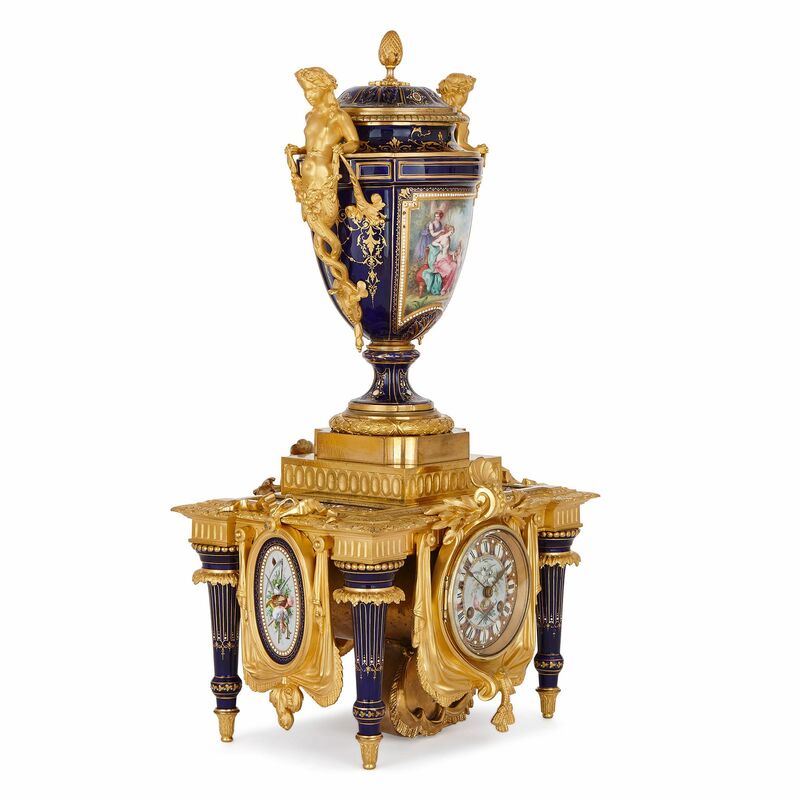 The central clock stands on four navy gilt-fluted porcelain columns. These have ormolu beaded and foliate-fringed tops, and tapered ends that terminate in ormolu peg feet. The columns support a rectangular top with a fluted frieze, from which ormolu draperies hang on all four sides. On the ends, these draperies frame oval porcelain plaques, which are painted with birds, musical instruments, and burning torches, set against foliate backdrops. A twin-handled, covered porcelain vase tops the clock. This stands on a stepped ormolu plinth, and splayed foot encircled by an ormolu laurel wreath. 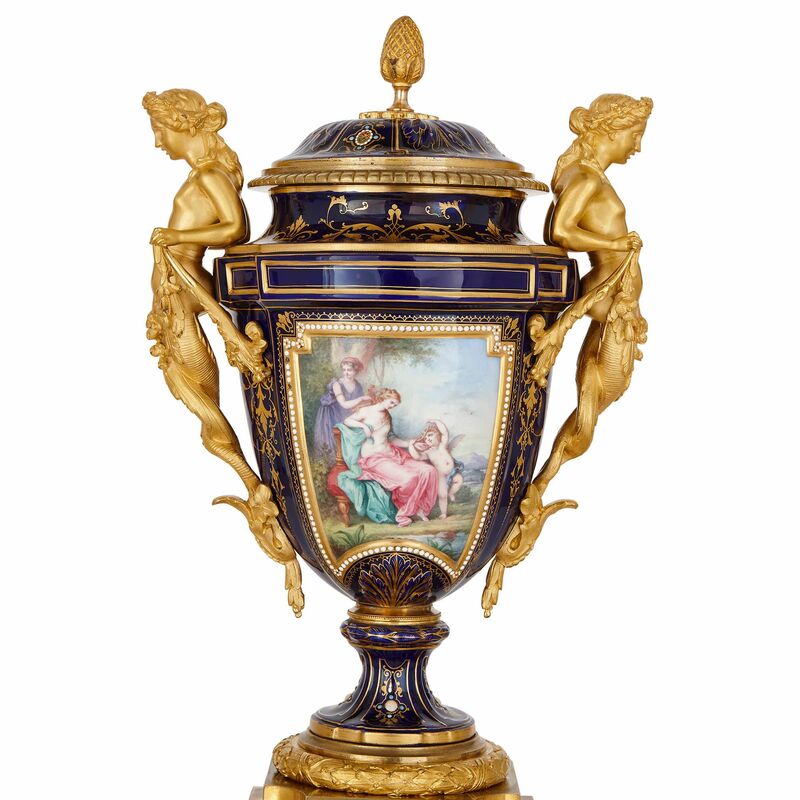 The foot, body and lid of the vase have been crafted from porcelain, which is painted a navy colour, and decorated with foliate, gilt motifs. The body of the vase is painted, on its front, with a scene, depicting a woman standing in a beautiful landscape, brushing the long, wavy blonde hair of the woman seated before her. This woman affectionately touches the cheek of a cupid who stands on the right. On the reverse of the vase body, a panel depicts a group of birds, perched on flowering branches. 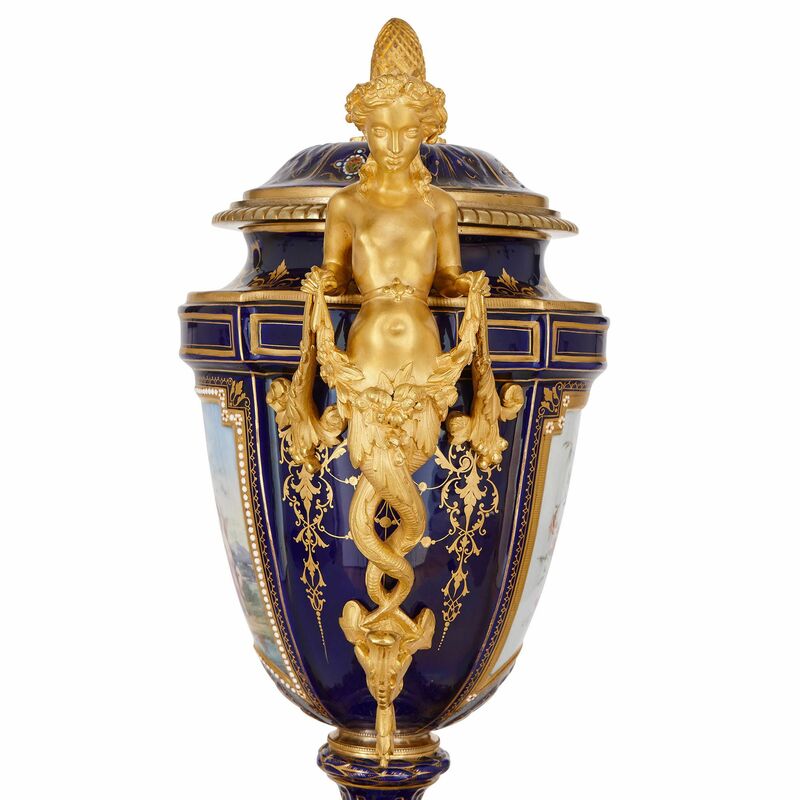 The vase is mounted with two ormolu handles, which take the form of classically-inspired female nudes with twisting lower bodies, who hold flower garlands. Above, the porcelain lid is topped by an ormolu pinecone finial. 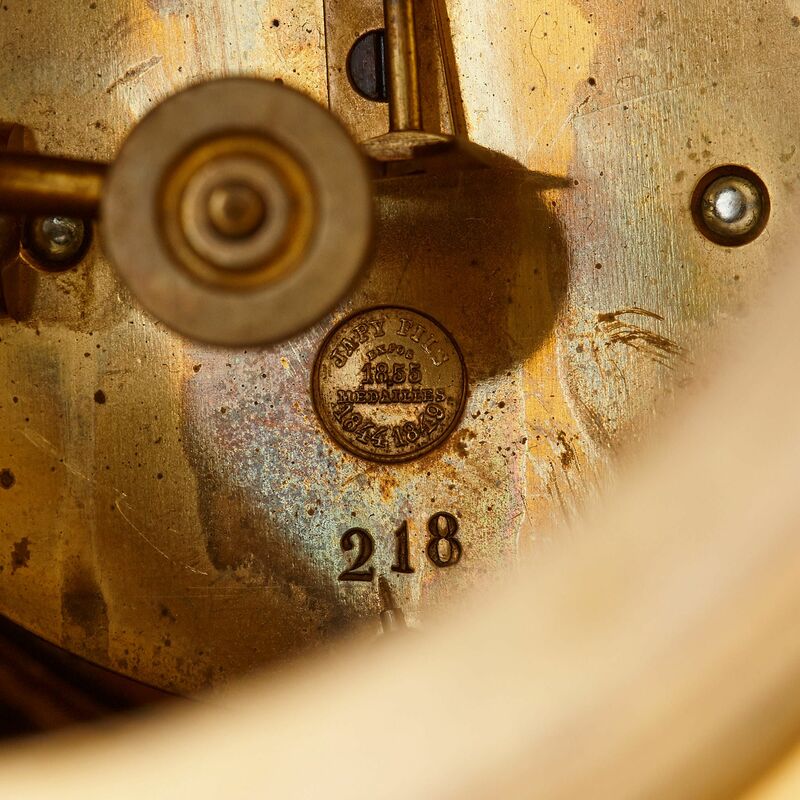 The two candelabra that flank the clock are similarly decorated. 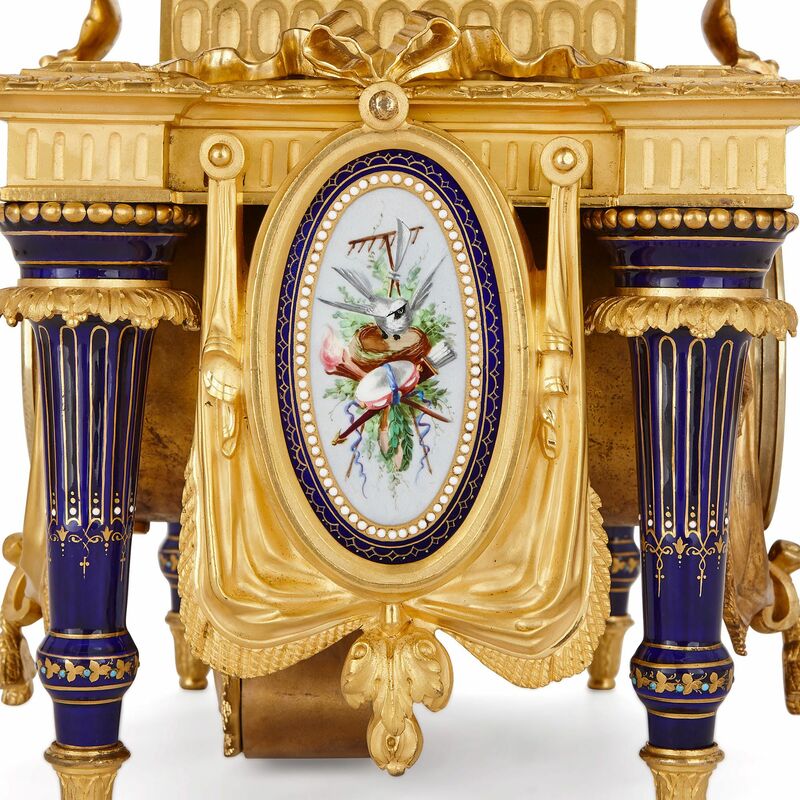 They stand on rectangular ormolu bases, with porcelain painted bodies, foliate ormolu aprons, and each set on two scrolled feet. 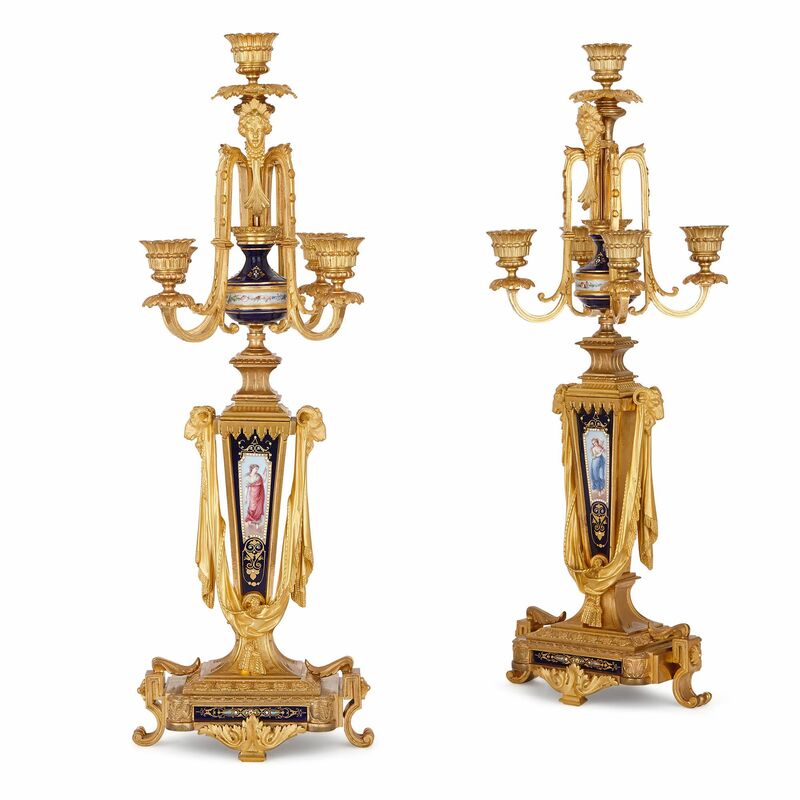 The candelabra stems are decorated with porcelain panels, depicting beautiful young women, and ormolu rams’ heads are mounted onto their sides, with draperies suspended between them. These stems are topped by bulbous, porcelain vase-like features, from where the ormolu arms of the candelabra spring. On each, four arms grow upwards, then droop down, before curving back up to terminate in foliate drip-pans, and beaded, petal-like capitals. A sixth arm, on each piece, extends upwards from the porcelain feature in a straight line, its front mounted with an ormolu, classical female mask.